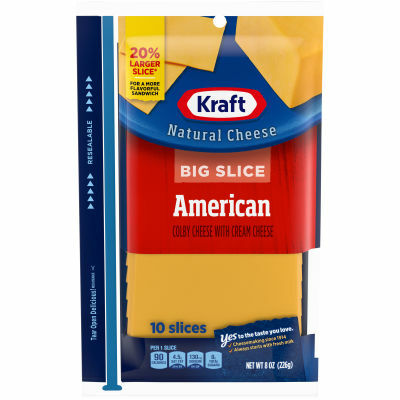 Enjoy Kraft Big Slice American Natural Cheese Slices! These big slices of natural cheese have bigger flavor in a BIG slice. In fact, these slices are 20% larger than your average slice for more flavor-need to compare to Kraft Natural Cheese regular slice per on pack langauge. Always made from fresh milk, Kraft natural cheese slices are perfect for your family’s favorite sandwiches, burgers, wraps, or whatever else your family loves. Each slice in this 8oz package is rich and full of flavor, and since this bag is resealable, you’ll enjoy a fresh slice every time. For over 100 years, Kraft has been making the cheese your family loves. So, no matter how you like it, we’ve got a cheese for you.